Data, devices and employees are mobilized and traffic is increasingly going to the internet and cloud applications. Traditional approaches to network protection are going away as the concept of a secure perimeter disappear. In this webcast we’ll look at today’s new business paradigm, the challenges we now face, along with best practices for building a secure network in the cloud. 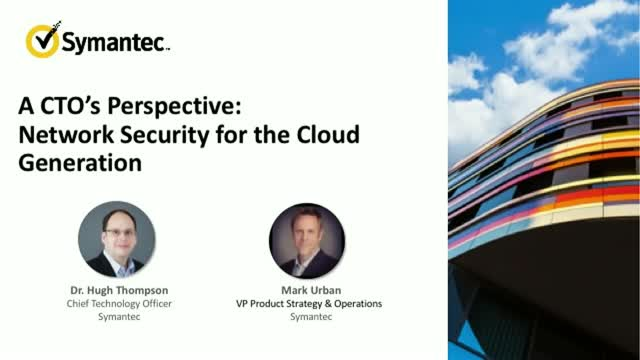 Join Hugh Thompson, CTO of Symantec, and Mark Urban, VP Product Strategy & Operations, Symantec as they share their vision for Cloud Generation Network Security and how they see leading companies of all sizes prepare for the future. It promises to be an insightful event for all security, network and IT professionals. After their presentation the speakers will also take questions from the audience. We highly encourage you to register and reserve your spot today. Misconfigurations of cloud services can lead to gaping holes in your cloud environment and present low hanging fruit for attackers. Cloud users need a proactive, automated approach to monitoring and securing the cloud control plane. • Configuration Errors: Monitor changes happening to cloud services in real-time and maintain your “gold standard” security posture. • Painstaking Triage: Automate the remediation process to handle any security issues for both inline as well as offline workflows. Office 365 has captured the imagination of many organizations, offering a wide range of productivity applications in a single platform. However, as organizations race to the cloud they realise that solving the security challenges may not be as straightforward as they hoped. The Office 365 platform encompasses communication, content creation and distribution applications stored in a cloud environment that’s open to all (any user, any device). In short, this single platform reflects the full range of security challenges that any organisation faces, so no wonder security deserves a deeper think. Join Sunil Choudrie, a Security Strategist from Symantec where he will discuss the security implications and key considerations for organizations that have moved, or are planning to move to Office 365. The cloud makes your teams faster and more agile. But they’re leaning on infrastructure as a service faster than you can secure it. With Symantec’s Cloud Security you are able to see who is using the cloud, how they are using the cloud, and if your information is at risk. Watch this demo to see how we can help you prevent against cloud misconfigurations, misuse, and data loss. What if security was baked in to your development workflow in a way that didn’t slow you down? Symantec Cloud Workload Protection (CWP), integrates into your DevOps workflows, automating security so you don’t have to think about it. Watch this demo to see how CWP helps you build securely while still shipping fast. It’s no news flash that misconfigurations cause the majority of cloud security failures. But how do you prioritize security tasks with your limited resources? Symantec Cloud Workload Assurance minimizes misconfigurations through automated discovery and continuous monitoring of your cloud environments. Watch this video to see how! In today’s world of increasing threats, there is a greater need to reduce the latency in data collection and act quickly based on that data. Join us on March 13 for a special webinar focused on our new real-time visibility and remediation capabilities to help protect and secure endpoints. Don’t miss this great opportunity to learn how Symantec endpoint management solutions can strengthen endpoint security and maximize user productivity. - Formjacking was the breakthrough threat of 2018, as cryptojacking and ransomware show signs of decline. However enterprises continue to face the problem of targeted ransomware. - Living off the land and supply chain attacks are now a staple of the new threat landscape. - Cloud users facing challenges on multiple fronts through data leaks from cloud storage and low-level chip vulnerabilities. - Targeted attack groups show increasing interest in operational targets; greater number of groups adopting destructive malware. Join us to learn how to automate security into the DevOps toolchain and strike a balance between agility and security in the cloud. Are you storing sensitive data and running business-critical operations in AWS? The news is full of stories about data exposure or loss involving misconfigurations, misuse, or compromised accounts in AWS. Analysts are urgently advising organizations to get automated controls and centralized management in place to secure their IaaS operations. As a result, IT organizations are increasingly looking to security providers such as Symantec for solutions to provide visibility, behavior monitoring, access controls, data security, and threat protection for AWS. As we become increasingly reliant on mobile devices, its vital to ensure we are being safe and protecting ourselves from potential threats. During this video, we will demonstrate how easy it is for a hacker to take full control of a mobile device, steal credentials, control and manipulate communications, steal identities and remotely record conversations without detection. In each case, see how Symantec Endpoint Protection Mobile (SEP Mobile, formerly Skycure) protects the device and data from attacks. Cyber threats continue to evolve and target enterprise weaknesses, while the cost and complexity of operating cyber security are increasing. And the old way of fighting cyber-attacks using fragmented tools no longer works. How do organisations adapt their cyber security technology strategies? There's a seismic shift happening in cyber security. Integrated platforms are the future. Join us for a webinar to hear how Symantec and our partners are working together to drive down the cost and complexity of cyber security, while protecting enterprises against sophisticated threats. Zero Trust is an architectural model that guides security teams on how to apply Zero Trust tenants to address the modern threat landscape. The model advocates a holistic approach to information security and puts special focus on processes and technologies that secure your data, wherever it resides. The objective is to strengthen data security and obfuscation – to limit risk derived from excessive user privileges and access. Benefits also include improved security detection and response with analytics and automation. Understanding key concepts at a high level is one thing. Properly implementing the model can be much more challenging. You’ll gain valuable insight whether you’re well on your way to Zero Trust implementation or are just considering it. Its your job to secure email, sensitive data and apps in Office 365. Now What? Moving to cloud applications provides the opportunity to get your security right. This is the time to set up optimum data loss prevention, malware and phishing prevention, and access controls on your systems. No matter if you are still planning, have just started, are in the midst, or are fully migrated to Office 365, there are security policies and procedures to implement and optimize. Snapper, a New Zealand-based company, needed a security solution to protect their customer data in Amazon Simple Storage Service (Amazon S3) from advanced threats and malware. In our upcoming webinar, learn why the flexibility and scalability of Symantec Cloud Workload Protection for Storage (CWP for Storage) made it the right solution for Snapper. Symantec is a global leader in providing security solutions to help our customers – from consumers and small businesses to the largest global organizations – secure their information against more risks at more points, more completely and efficiently than any other company. Our company’s unique focus is to eliminate risks to information, technology and processes independent of the device, platform, interaction or location.